I wish I looked as good when I had a bad hair day. Smoky asked me to make sure you knew that it wasn't a bad "hare" day. She's a very well behaved bunny. I think these are some cute bunny feet! I think everything about her is cute.I wouldn't mind a bad hair day if I was that cute. 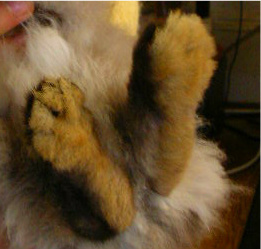 Those bunny feet are so cute! I always loved cat's hind paws, too. I think they're similar...so soft and kind of hand-shaped. If you want to email me about scarf I can give you some help. My address is on my profile. It is very easy - even for a beginner. Anyone could tell at one glance that she's not a bad hare! She's too cute! I might look OK with that hare! Tell Smokey she would totally Rock an '80's or 90's band look! Too cute! Oh I love bunnies...this is so cute.